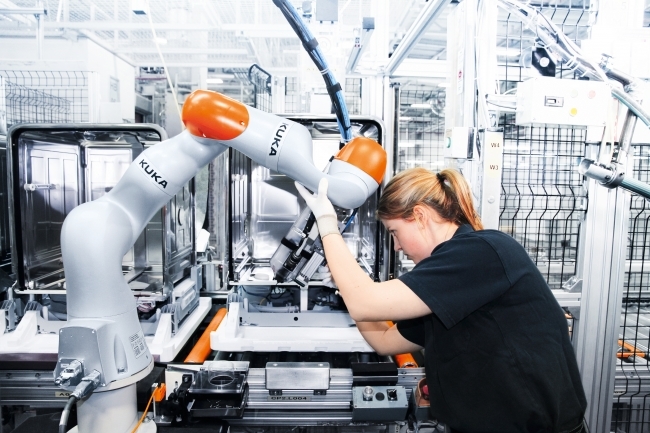 Humans and robots are working more closely together as technology improves. This is increasing the productivity of companies and the quality of products, leading to efficiency and growth. In many cases robots increase output so much that more jobs are created in complementary jobs. Researchers and companies are improving the safety of robot systems so humans can work close beside robots that become co-workers, more than mere tools. The next step for robot makers, software companies and engineers is to refine human-robot job augmentation further to achieve a greater shift in productivity, freeing people to do higher value and less dangerous work. 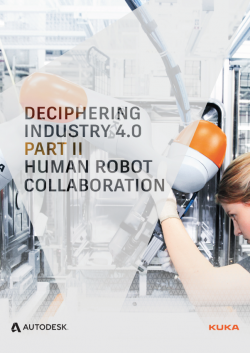 Autodesk and KUKA Robotics UK have combined to explain how some of the new digital technologies that will transform manufacturing – the development of smaller “desk top” robots, known as collaborative robots or “cobots”, was brought about from a new application of robots that is rapidly taking hold globally: human robot collaboration (or HRC). There are new business and domestic scenarios where robots are designed to work alongside humans – rather than as a distinctly separate and binary tool behind a cage.